Real Estate: First half of 2016 characterized by increased institutional financing, as well as increased development activities, especially in the low to middle income residential and hospitality sectors. Regulations were also adjusted to be more developer friendly with the NCA and NEMA fees being scrapped. We will be formally launching our entry level training program, Cytonn Young Leaders Program, ?CYLP?, on 15th July 2016 at Sarova Panafric Hotel. Through CYLP, we have trained 180 university graduates since its inception two years ago, and we have made employment offers to 57 of these program participants. The first half of 2016 was characterized by sluggish global growth, and as per World Bank?s Global Economic Prospect in June, they revised the 2016 global growth projections downwards to 2.4%, from 2.9% earlier projected in January 2016. The downward revision was brought about by (i) the slow growth in the developed markets, (ii) low commodity prices affecting emerging markets, (iii) weak global trade, and (iv) diminishing capital flows. Emerging Markets: The regions are expected to grow at 3.5%, compared to 3.4% in 2015, with the commodity importers expected to do much better than commodity exporters. US economic growth slowed to 1.1% in Q1?2016, down from 1.4% in Q4?2015, and was higher than the US Department of Commerce?s projection of 1.0% growth. Growth was higher than projected due to higher than expected consumer spending, and low borrowing costs, which have also propelled household demand and property demand forward. The US Federal Reserve left the Fed rate unchanged at its meeting in June 2016. Recent economic data from the US, as well as the ?Brexit?, now reduces the likelihood of there being any increases in the Fed funds rate through the rest of the year as earlier predicted. The Fed?s decision to hold rates was based on mixed signals from the economy. While there is growth in economic activity and some improvements in the housing sector, a slowdown in the labor market, diminishing job gains and low business fixed investments brings into question the strength of the economy. Additionally, inflation in the US has remained low, and was at 1.0% in May 2016, below their target 2.0%, making it difficult for the Fed to raise rates. Therefore, due to uncertainty in economic conditions both globally and in the US, the Fed decided to keep the rate constant. The stock market has been stable, with S&P 500 having gained 1.0% YTD, largely driven by the Fed?s decision to hold rates and further easing measures in the Eurozone. However, company pre-tax earnings have declined on average by 3.3% q/q since Q4?2015 and a remarkable 7.8% y/y from Q1?2015, the largest decline since the first quarter of 2011. On the valuations, Cyclically Adjusted Price/Earnings (CAPE) ratio is currently near historical highs at 26.4x, far above the historical average of 16.0x, indicating an overvaluation of the market. We expect the US market to remain volatile with possibilities of declines for the remainder of 2016 unless earnings reports show strong growth. Additionally, we do not expect any further rate hike in 2016 given the concerns over job growth, and any negative ripple effect on the US as a result of ?Brexit?. The GDP growth rate for the region was 0.5% in Q1?2016, up from the 0.3% growth witnessed in Q4?2015. Manufacturing activity increased as measured by the Purchasing Managers Index, which rose to 52.6 in Q2?2016, up from 51.6 at the end of Q1?2016. The market expectation for Eurozone Q2?2016 GDP growth stands at 0.6% for the quarter, and a y/y projection of 1.7%, which has recently increased on the back of improved consumer spending. The Euro Stoxx 300 has also been on a downward trend, losing 10.2% YTD due to the uncertainty surrounding ?Brexit? and the inability of Eurozone to stimulate inflation back to the target of 1.0%; and the announcement of the additional stimulus has done little to calm the markets. The European Central Bank (ECB) met in March and delivered an additional round of quantitative easing in Q1?2016, with the following measures; (i) increased the rate of asset purchases under their ongoing Quantitative Easing (QE) programme to Euro 80.0 bn per month, from Euro 60.0 bn per month previously, (ii) reduced the base lending rate by 5.0 basis points to 0.00% from 0.05%, (iii) reduced the deposit lending facility rate by 10 basis points to -0.4% from -0.3%, and (iv) included investment grade euro-denominated bonds issued by non-bank corporations established in the euro area in the list of assets that are eligible for purchase under the QE programme. Moving forward, one of the main concerns will be what kind of agreement is negotiated with the UK on its exit from the EU and how the rest of the members shall react to it. Additionally, inflation remains an issue to Eurozone growth, which currently stands at -0.2% and struggling to reach the 1.0% target. Key factors for the deflation currently being experienced in the Eurozone are (i) unemployment rate is at 10.3% in Q1?2016, remaining above the long-term average of 9.9%, (ii) average Eurozone GDP growth rate still well below 2.0%, and (iii) the decline in world oil prices. We expect the ECB to continue their QE programme, and possibly even extend the programme beyond March 2017 if the deflationary environment persists. The Chinese economy grew by 6.7% in Q1?2016, the slowest quarterly growth in 7 years, down from a GDP growth of 6.8% in Q4?2015 and the 6.9% annual growth rate in 2015. This can be attributed to the shift of the Chinese economy from a manufacturing and export led economy, to one more focused on services. This transition is at the heart of the movement from a Communist to a Capitalist market in China. Export growth in China has been fueled by public-debt financing, which has led to unsustainable growth and debt levels. In order to create an economy with less interference from Government, China is moving to a services led economy, which will hinge on increased consumer spending and private entrepreneurship. The end goal is to move away from a low-paying factory job workforce, to a services led high-paying workforce, which will grow household incomes and increase local domestic demand. In order to stimulate growth, the People?s Bank of China has cut policy rates six times since November 2014, from 6.0% to 4.35% currently, and the bank?s reserve requirement ratio to 17.0% from 17.5%, amidst signals of further policy easing. At the start of the year, the Chinese Government set a GDP growth target range of 6.5% - 7.0% for 2016, despite high levels of capital outflow. The Shanghai Composite has been one of the worst performing indices in 2016, having declined 17.2% YTD as of Q2?2016. China has also recently suffered downgrades by S&P and Moody?s, with their outlook turning negative from stable, citing the government?s reform agenda is on track but likely to proceed slower than expected. The transition will not be easy for the Chinese economy, and we expect further rate cuts to stimulate growth, as China eases monetary policy further to stimulate domestic demand. Drop in Commodity Prices ?As shown below, global commodity prices have plummeted in 2016, and are only expected to stabilize in 2017, further affecting economies that are commodity dependent such as Nigeria, Ghana and other oil and metal exporting nations. Ebola Effect ? Countries affected by Ebola are expected to record subdued growth in 2016 as they recover from the effects of the epidemic. Sub-Saharan African stock markets have significantly underperformed, with negative returns across the board as illustrated below. This can be attributable to weak economic performance, including (i) falling commodity prices, (ii) reduced foreign investor interest in holding African stocks, and (iii) lower than expected earnings growth. We still maintain our view that infrastructural spending, stable commodity prices and political stability are what will drive Africa?s growth. Kenya?s macroeconomic environment has improved compared to 2015, leading to us maintaining our projections for the full year GDP growth at 5.8%. This is expected to be underpinned by (i) high government expenditure on infrastructure, (ii) the energy sector growing at 6.5%, (iii) real estate and construction growing at 11.1%, (iv) agriculture growing at 4.0%, and (iv) the recovery of tourism, growing positively at 3.3%. Q1?2016 GDP figures were released, posting an impressive 5.9% growth, up 90 bps from the 5.0% recorded in Q1?2015. The sectors that supported the growth include: Agriculture (4.8%), Construction (9.9%), Tourism (12.1%) and Financial Intermediation (9.8%). Key to note is that tourism is firmly on the path of recovery, posting a growth of 12.1%. Kenyan Treasury released their largest ever budget for the country, at Kshs 2.3 tn with the split between recurrent and development expenditure at Kshs. 1.2 tn / 52.2% and Kshs. 1.1 tn / 47.8%, respectively. The funding of the budget is as follows: (i) tax collection (Kshs. 1.4 tn) / 60.9%, (ii) net domestic borrowing (Kshs. 241.1 bn) / 10.5%, and (iv) foreign borrowing (Kshs. 459.4 bn) / 19.9%, with the balance of 8.7% from grants and aid. The budget is based on a GDP growth assumption of 6.0%, and having achieved 5.9% already in Q1?2016, the prospects of achieving this budget?s GDP growth assumption is higher than for fiscal year 2015/16, which budgeted 6.9% GDP growth but achieved 5.8% GDP growth. The reliance on debt funding continues to grow and, as much as it is concerning to the market, we think the current levels are still sustainable. The projections as at the end of the next financial year show that the debt-to-GDP shall be at 48.6%, well within the emerging markets tolerance levels of about 50%. Historically, The Kenya Revenue Authority (KRA) has missed their tax collection targets and despite the improvements in tax efficiency, we think that KRA will still miss tax collection targets in the 2016/17 fiscal year, due to (i) the high target they have, and (ii) the inability to effectively tax the informal sector in Kenya. However with the improvement in economic growth this shall translate to better earnings for companies and improve the employment status of the country and this would translate to better collections. The economy is expected to do well, however, Government needs to address the issue of (i) corruption and mismanagement of public funds, and (ii) efficient allocation of budgetary resources, for Kenya to realize double-digit GDP growth as outlined in Vision 2030. The Kenya Shilling has been stable during the year having appreciated 1.2% during the year supported by (i) the high levels of foreign exchange reserves currently at USD 7.6 bn, equivalent to 5.0 months of import cover, and (ii) improved diaspora remittances, with cumulative 12 months? inflows to March 2016 increasing by 10.2% to USD 1.6 bn from USD 1.5 bn in March 2015. Going forward, we project a more stable shilling supported by the weak dollar in the global markets and the resilience of the shilling due to the diverse nature of our economy. The key risk facing the shilling is the increasing foreign debt that has to be serviced in USD terms, and that might mean the government is buying USD during the repayments. Inflation has been on a steady decline during the year from the 8.0% recorded in December 2015, owing to relatively lower food and fuel prices in the first quarter of the year. It however picked up in June 2016, to 5.8% from 5.0% in May 2016 due to an 8.9% increment in the Food and Non-Alcoholic beverage Consumer Price Index. We however expect inflation to remain steady with our projections, pointing to a yearly average of 5.9%, down from our projection of 7.0% owing to the postponement of the VAT on fuel products to September 2017. The key risk facing inflation is an increase in food prices locally and an increase in oil prices globally. We also expect a slight uptick in the coming months as the road levies on petroleum products kick in. (i) Shilling has appreciated 1.2% against the dollar. Stock market seems to be fairly valued, trading at a PE of 12.8x compared to historical average of 13.8x. Assumption of corporate earnings growth rate of approximately 10.0% gives a forward PE of 11.9x ? 11.6x compared to historical averages. (i) The banking sector recorded an EPS growth of 13.6% in Q1?2016. In summary, the macroeconomic environment has improved since the beginning of the year. Of the seven macroeconomic indicators that we follow, 1 has worsened, 3 have stayed the same and 3 have improved over the last 6 months. GDP (Positive), inflation (Neutral) and investor sentiment (Neutral) have remained the same; interest rates (Negative to Neutral), exchange rates (Negative to Neutral) and corporate earnings (Neutral to Positive) have improved; and security (Positive to Neutral) has worsened. With a more favourable operating environment as compared to the beginning of the year, we expect markets to perform better in H2?2016. During H1?2016, yields on T-bills were on a downward trend with the 91, 182 and 364-day declining by 330 bps, 130 bps, and 170 bps, respectively, to 7.1%, 9.8% and 11.1% from 10.4%, 11.1% and 12.8% in December 2015, respectively. The decline in yields was as a result of high liquidity in the markets in the second quarter, due to flight to safety by most investors. There was increased activity in the secondary bond market, with bond turnover increasing by 32.0% from Kshs. 189.3 tn in H1?2015 to Kshs. 249.9 tn in H1?2016. The heightened activity can be attributed to (i) the continued increase in liquidity in the money market, and (ii) flight to quality by investors. During the first half of the year, the money markets were characterized by (i) high liquidity, which was skewed towards the larger banks as a result of flight to safety following the closure of Chase Bank, and (ii) Central Bank of Kenya (?CBK?) actively participating in the money market to support small banks. This can be evidenced by (i) the decline in average interbank rate from 8.7% in H1?2015 to 4.4% in H1?2016, and (ii) the oversubscription of government securities. The graph below show the interbank rate evolution during the year, with the spike towards the end of H1?2016 attributed to a sudden tightness of liquidity in the market as banks remitted their quarterly tax payments for June 2016. In the 2015/2016 financial year, Government planned to borrow Kshs. 620.9 bn of which Kshs. 219.2 bn was from domestic borrowing, while Kshs. 401.7 bn was from foreign borrowing. They managed to borrow Kshs. 670.5, of which Kshs 373.8 bn was from the domestic market and Kshs. 296.7 bn was from foreign markets; the excess from domestic borrowing plugged the deficit arising from foreign borrowing. However we are beginning a new fiscal year with a much larger budget and an 11.0% increment in financing through borrowing to Kshs. 689.1 bn, divided Kshs 229.6 bn domestic and Kshs 459.4 bn foreign. Brexit has made external financing conditions even more difficult. Consequently, it is highly likely that the Government may find itself in the same position they were in late last year, where they funded more from domestic than they did from external markets, and this may have upward pressure on interest rates. It is due to this uncertainty that we advise investors to be biased towards short to medium term papers for tenors between six-months and one-year. 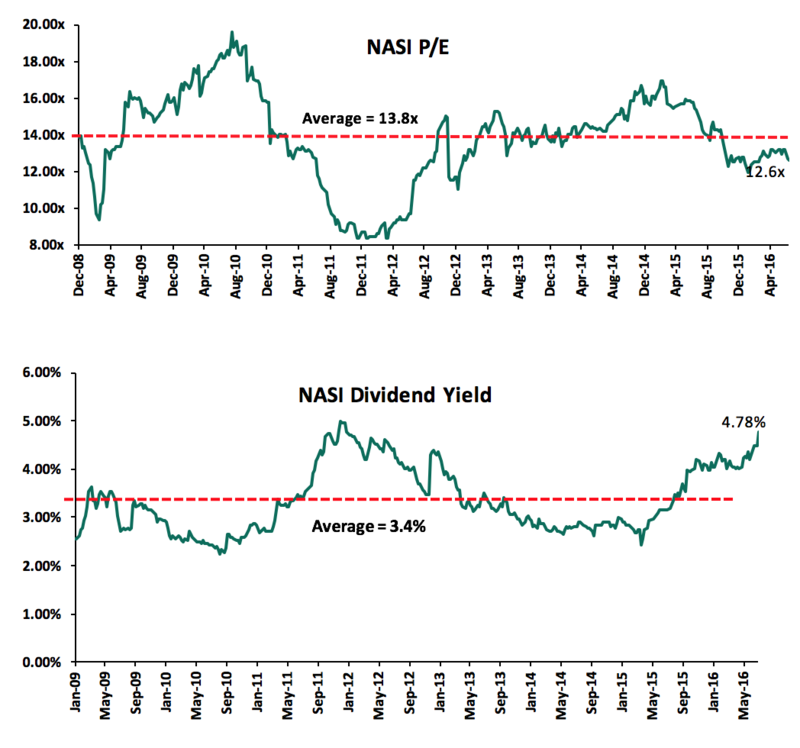 During H1?2016, the Kenyan equities market was on a downward trend, with NASI, NSE 25 and NSE 20 declining by 3.5%, 9.9% and 5.7%, respectively, driven by decline in large cap stocks. YTD, 51 stocks have declined, 6 stocks remaining unchanged while only 9 stocks have risen in price. Among the top 10 stocks by market cap, Safaricom, BAT and EABL rose by 8.9%, 6.4% and 1.8%, respectively, on the back of increased foreign demand, while Safaricom posted an 18.8% growth in EPS. Barclays, KCB Group and DTB were the biggest losers, declining by 29.4%, 22.9% and 11.8%, respectively, with Barclays continuing to face negative investor sentiment as a result of the impending exit of Barclays Group Plc from Africa, while investor sentiment weakened on KCB Group on the back of poor earnings having posted a core EPS growth of 6.1% in Q1?2016. The banking sector has generally been out of favor in 2016 given the turbulence in the banking sector and suspicion around asset quality in the sector. Equity turnover during H1?2016 rose by 49.5% to Kshs 74.3 bn, compared to Kshs 49.7 bn in H1?2015. Foreign investors were net buyers with net inflows of Kshs 15.8 bn compared to net outflows of Kshs 3.4 bn recorded in H1?2015. The sustained foreign investor inflows during H1?2016 can be attributed to improving investor sentiment, with 2015 GDP rising by 5.6% and on the back of declining interest rates and inflation. However, post-Brexit, foreigners have turned to net sellers, preferring safe dollar markets, leading to significant outflows in the last week of H1?2016; net exits amounted to USD 333,000. The market is currently trading at a price to earnings ratio of 12.6x, flat from the beginning of the year vs. a historical average of 13.8x, with a dividend yield of 4.8%, vs. a historical average of 3.4%. During H1?2016, banks released FY?2015 and Q1?2016 results, while insurance companies released FY?2015 results, with both recording improved performance. In summary, the banking sector is in transition to a more transparent, well-governed and efficient sector, which will have fewer players, who are larger and more stable. Leading this transition is a disciplined regulator, who has indicated that the level of supervision and oversight will increase, with a focus on corporate governance. In addition, given the challenges banks are facing with their capital ratios, as well as competition for deposits, we will see increased consolidation and realignment in the sector. See our FY?2015 and Q1?2016 banking reports. Listed Insurance Companies? released their FY?2015 results. In our view, the sector remains attractive with vast potential, however we have witnessed the insurance sector grappling with low penetration, alongside slowing premium growth, increased cases of fraudulent claims and the required increase in capital following adoption of a risk based capital adequacy framework. As such, given the changing dynamics in the insurance sector, we hope that regulation and oversight in the insurance sector is up to speed. For more information on the listed insurance companies FY?2015 performance, see our Listed Insurance Companies FY?2015 Report. During HY?2016, Nairobi Business Ventures (NBV), the proprietor for the shoe vendor K-Shoe, listed on the GEMS segment of the Nairobi Securities Exchange, with plans to raise cash for establishment of a leather footwear and accessories manufacturing plant in Kenya. NBV was listed through introduction, offering 23.6 million shares valued at Kshs 5.0 each, putting the valuation of the company at Kshs 118 mn and at a price to earnings ratio of 26.7x. NBV became the 5th company to be listed in the GEMS Segment. Kengen has raised Kshs 25.5 bn from a rights issue, a 92.0% subscription out of the targeted Kshs 28.8 bn. Kengen had offered 4.4 million shares at a price of Kshs 6.6 per share, in an entitlement ratio of 2:1. Government, which holds a 70% stake, fully took up all its entitled rights, to avoid dilution through a conversion of debt to equity. The successful rights issue will improve Kengen?s liquidity and capital structure, opening up its balance sheet to allow for more borrowing. Despite the poor YTD equities market performance in H1?2016, listed companies have delivered better results in 2016 compared to 2015. The better results can be attributed to improved macroeconomic conditions in 2016 compared to 2015, with Q1?2016 GDP growth coming in at 5.9%, compared to a growth of 4.9% in Q1?2015. Out of the 7 factors that we track, as shown in the table in our Kenya Macroeconomic Review section, 2 are currently positive and 5 are neutral, this is an improvement from 2 positives, 3 neutrals and 2 negatives. As such, we revise our view upwards from ?neutral? to ?neutral with a bias to positive? given the higher earnings prospects, supported by a favorable macroeconomic environment. During the first half of 2016, the East Africa Venture Capital Association published the East Africa Private Equity Dashboard report. Kenya emerged as the top investment destination in the region followed by Tanzania and Ethiopia. Deals have been focused on the financial, FMCG and energy sectors, which took up 81% of total invested capital in the East African region. The financial services sector attracted most deals for the half-year ending June 2016, favored by an innovative market with quick adoption of new products, services, technology and distribution channels. IFC committed Kshs 10.0 bn in debt to Equity Group Holdings to be used to loan out to SMEs. The largest proportion of these loans will target women entrepreneurs and will enable Equity Group to cement their footprint in the SME sector. Financial services sector continues to attract private equity players driven by (i) improved regulatory frameworks, (ii) growth of the middle class population with increasing numbers seeking financial services, and (iii) innovation in the sector with integration of mobile technology. Atlanta-based Coca-Cola has bought a 40% stake in Chi, Nigeria's largest juice maker for USD 240 mn, a stake that it plans to increase to 100% in 3 years. The FMCG sector is expected to continue witnessing increased activity from both local and global players with the growth of the middle class in the region. Denham Capital and GreenWish Partners partnered to develop, build and finance a portfolio of 600 megawatts (MW) of renewable energy assets across Sub-Saharan Africa by 2020, as part of their USD 1.0 bn project pipeline. Barclays Plc has offloaded 12.2% of its 62.3% stake in Barclays Africa worth roughly USD 879 mn to simplify its structure in line with the current CEOs strategy of selling down Barclays Plc?s stake in Barclays Africa Group, with Carlyle Group and former Barclays CEO Bob Diamond expressing interest to own the bank. This quarter we witnessed three key trends. These were financing activities, regulation and increased development. All of these three are important to increase the level of institutional grade housing and real estate development in Kenya, especially towards reducing the annual housing deficit of 200,000 units per annum. China Africa Development Fund (CADFund), which plans to partner with the government to redevelop 1,000 units in Ngara East Estate. Through the same fund, a local developer Suraya in conjunction with CCECC (China Construction Engineering Construction Consultants Corporation) are set to develop 10,000 affordable units for the civil servants and the public and a further 20,000 affordable housing units for the Kenya Police. Real Estate Investment Trusts (REITs) ? After the listing of the Fahari I-REIT towards the end of 2015, the trading has remained low, with a total turnover of Kshs 117.4 mn having traded. In the month of June, Fusion Capital launched a D-REIT, targeting to raise Kshs 2.3 bn to fund their real estate development project dubbed ?Green Wood? in Meru, Kenya. Fusion estimates that investing in the REIT will result to Kshs 1.2 bn profit, with a project IRR of 20.3%. We will be covering it extensively in our weekly on 10th July 2016. Challenges ? Despite the increased amount of financing available, it is still at a high cost and can go as high as 21% for development and mortgages, resulting in developers performing poorly, and large expenses for end-buyers These include Home Afrika, who recorded a 62.2% decline in revenue, and Kamuthi Housing Cooperative and Lake Basin Development Authority who risk losing property worth Kshs 4.0 bn and Kshs 2.5 bn to banks due to unpaid debts, respectively. We expect to see increased real estate development in the second half of the year as a result of this financing. In addition, the high rate of returns currently being earned in the Kenyan market is likely to continue attracting more investments into the sector. With the prevailing interest rates expected to remain at their current levels, developers and borrowers ought to structure their loans favorably to avoid incurring losses and being competed out of the market. With increased transparency, faster processes and lower costs being incurred in the development process, we expect development activity will increase in the country, as developers will save on time and costs previously incurred, as fees will be used to add value to developments. Regulation- Previously characterized by opacity, a number of laws and regulations have been passed or proposed to increase transparency in the sector, especially in land transactions. For instance, the NCA established an online platform for registration of contractors and licensing. The collapse of a five-storey building in Huruma led to NCA starting a nationwide demolition of substandard buildings, an activity that is still ongoing. Treasury also allowed NSSF to channel mortgages to the public and is planning to set up mortgage liquidity facility to lend to Saccos, enabling them to lend onwards to their members in greater amounts. We expect these trends to continue through to the second half of 2016. In addition, we expect increased focus on the low to middle income residential segment as a result of government incentives, economies of scale, increased financing, high returns and increased financing from both the supply and demand side.